Today, we woke up at 3:00am, ate a quick breakfast, then headed out into the cold predawn hours and headed up toward Camp I. 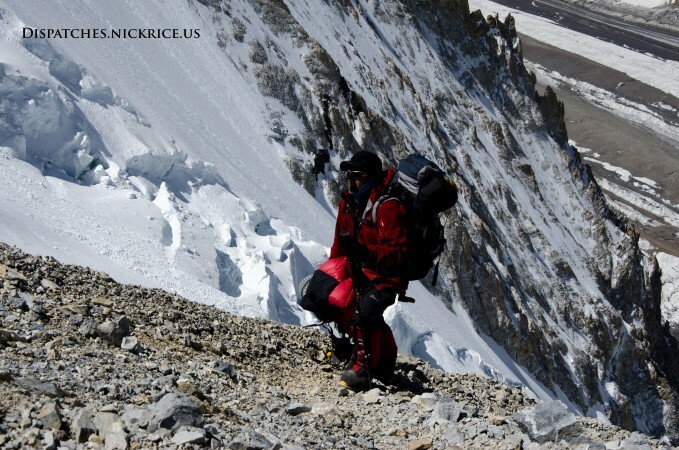 As we began climbing up the steep base of the route, we heard a large avalanche, looked up and saw that it was coming from the serac below Camp III and heading in our direction. After ducking behind rocks, we were relieved when it didn’t make it all the way down to us, and continued heading up toward Camp I. After reaching ABC and taking a quick break there, we continued up. As we were passing some large rock outcroppings, we were shocked at how many fast-falling rocks were whizzing by us, and unfortunately, one of them managed to bounce off of the snow slope directly in front of Pilar, and slammed into her face just underneath her helmet. Luckily, Ana, a doctor climbing with the Spanish expedition, was descending from Camp I and I asked her to take a look at Pilar when she reached her. She had to pull out pieces of Pilar’s broken sunglasses from her face and gave her 4 stitches just under her eye. She arrived to Camp I and insisted that we all continue to Camp II as planned, despite our recommendations. We arrived to Camp II in the early afternoon and settled in. Lina and I discussed the plan for the following day and decided to spend the day in Camp II and move our tent spot a few hundred meters higher to a better place. We ate a quick dinner and went to sleep as the temperature dropped. Pilar slept in Lina’s tent that we put up the previous acclimatization cycle. She insisted on climbing up to Camp III the following day with the Hungarians. Lina and I know that the climb to Camp III is very long this year and that we carried quite a heavy load to Camp II today, so we insisted on staying in Camp II for an additional day in order to recover and to make a better tent platform that will withstand a storm in Camp II.